However it happened, I'm so grateful to have connected with such a fantastic community of women. For one thing, people are actually reading my blog from time to time! What a novel concept! I have been so challenged and encouraged by what others have written this past month. I've even learned a thing or two about baseball stadiums, and of an architect who glorifies God in his designs. I've especially echoed the thoughts of Lisa, when she asked, Church, where are we? Yes, really, where are we? But more importantly, I've found some neat women on the web with whom I will stay connected --Nikki, Tara, and Lindsey -- to name a few. And bless you Tereasa who encouraged me even when my writing was a bit disjointed and nonsensical. We share so many of the same dreams, challenges and struggles. It's comforting to know that I'm so very *not* alone in anything. I've also met another Wisconsinite or two. Yay! On a blogging technical note, I've discovered that I love the Disqus commenting system and am installing it on my blog as well (it's importing and syncing right now). As I've been reading and commenting on more blogs than usual this last month, it has been so convenient to have the little notifier pop up that someone has replied to a comment I'd made. It's also handy to log into the Disqus dashboard to see on which posts I've commented, so I can quickly find again those posts that really spoke to me. It was nice meeting everyone and I will definitely stay in touch with your blogs! Thank you to Stacey and Katie for putting this together. It's been a blast! Lord willing, I'll see some of you in October. If not, perhaps at a later conference, after we get my recent bout with appendicitis paid for! 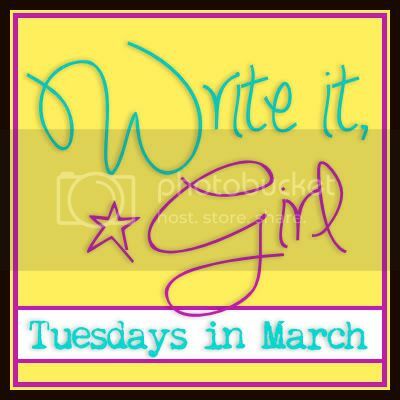 What does it mean to you to be a Write It, Girl? I look forward to reading your responses.